VIA Technologies have announced their VT6047 Pico-ITX form factor reference design, which packs a full featured x86 motherboard and processor into 50% the surface area of a Nano-ITX and 25% the area of a Mini-ITX board. The tiny 100 x 72 mm VT6047 was designed to be powered by a VIA C7 or fanless VIA Eden V4 bus processor in a 21 x 21 mm NanoBGA2 package at up to 1.5GHz. 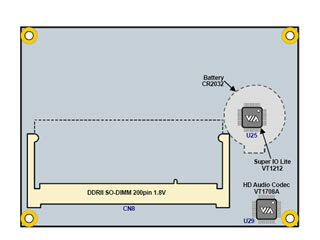 When running in optimised low voltage mode, the onboard CPU delivers power consumption below one watt. A Pico-ITX power supply is only required to provide 22W max and 25W peak power, giving an idea of the power consumption of a typical Pico-ITX system. 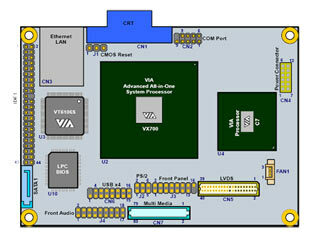 The VX700 chipset combines core logic, multimedia, connectivity and storage capabilities within a single-chip package. The VX700 supports up to a 533MHz FSB; VIA's Unichrome Pro II graphics core with MPEG-2/4 and WMV9 hardware acceleration; LVDS/DVI connectivity with dual monitor support (in conjunction with the VGA connector); 7.1 channel high definition audio; and SATA, PATA, USB, PS/2, Ethernet and Serial connectivity. 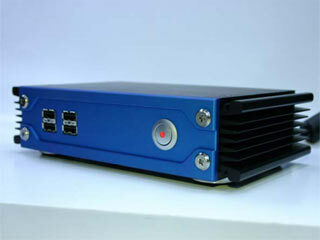 The Pico-ITX mainboard form factor was designed specifically for small footprint appliances such as the Embedded PC, Digital Signage, Thin Client, KIOSK, or VIA's reference Set Top Box design pictured here. VIA hope the Pico-ITX form factor will "enable system developers and OEMs to create smaller, lighter, quieter and even more mobile devices than ever before, opening up a new world of possibilities across multiple embedded PC, system and appliance segments". Attentive readers will have spotted the "VT" and not the "PX" moniker. VIA traditionally introduces their reference designs as an introduction for embedded computing builders, followed by retail product aimed at PC enthusiasts and smaller scale system builders. 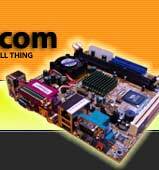 The EPIA 5000 and 800 were the first retail Mini-ITX motherboards back in 2002, but were preceded a few months earlier by the VT6010 reference design. Connectors starting from the top left: 44-pin IDE, SATA connector, RJ45 Ethernet port, VT6106s Ethernet controller, LPC BIOS, CRT connector, CMOS reset, COM port, VX700 system processor (centre of the board), 4 x USB 2.0, PS2, Front Audio, Front Panel, Multi Media, C7 or Eden processor, Fan connector, LVDS, 12 pin Pico-ITX power connector. The CRT and Ethernet connectors are the only full-size connectors on the board. A 400/533Mhz DDR2 So-DIMM sits on the underside of the board, together with the battery, VT1212 Super IO Lite controller and VT1708A Audio Codec. 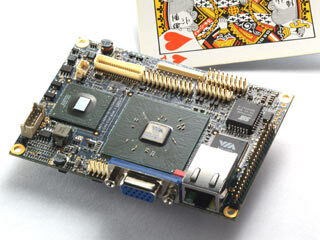 Unlike the Nano-ITX, there is no room for a Mini-PCI socket. One USB header for four USB 2.0 ports.